The late Princess Mother was, by just about every measure, a truly extraordinary woman. Born a commoner in 1900, this daughter of a goldsmith rose to become the mother of two kings. Its entirely arguable that Her Royal Highness Princess Srinakarin, as she was to be properly known, was the person most responsible for shaping modern Thailand. Mae Fa Luang ('mother of us all'), as she is still commonly referred to by Thais, was born in Nonthaburi province north of Bangkok. The family later moved to Thonburi, across the river from Bangkok, in the area of Wat Anongkharam, and the Princess Mother always considered this area her home. The young Sangwon (her given name) was among the first generation of Thai women to receive some kind of formal education. She learned to read and write from her mother, and then attended school in the Wat Anongkharam community. Later, she attended nursing school at Siriraj Hospital. Apparently, she acquitted herself quite well, since she was selected to continue her studies in the USA. It was in the USA that she met her future husband, HRH the Prince of Songkhla (Prince Mahidol). Prince Mahidol was the 69th son of King Chulalongkorn (Rama V) and not believed to be in line for the throne. He had a passion for medicine and helped to establish Siriraj Hospital. He was studying medicine at MIT in the USA when he met his future wife. The Prince and his new Princess were married at Sra Pathum Palace in 1920, but they didn't stay in Thailand long. They returned to the USA to continue their studies, and then moved on to Europe. In short order, the young princess gave birth to a daughter, now Princess Galyani, in London, their first son Ananda, who became King Rama VIII, was born in Heidelberg Germany, and their second son Bumiphol, now King Rama IX, was born in Massachusetts in the USA. Sadly, Prince Mahidol did not live to see either of his sons become king. He passed away at Sra Pathum Palace in 1929. The Princess Mother returned with her three children to Lausanne Switzerland for their schooling. She returned with her sons after WWII and lived at Sra Pathum Palace, while in Bangkok, until her death in 1995. Her funeral in 1996 was one of the saddest moments in Thailand in the last 20 years. The Princess Mother never forgot her humble origins or the royal gift which set her on the path to becoming one of the most important women in modern Thailand. She worked tirelessly throughout her life to repay the gift many-fold. 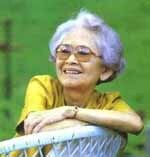 She established many foundations chartered with bettering the lives of the poor and disadvantaged in Thailand. Among the most well-known is the Doi Tung foundation, headquartered at her mountain home in Thailand's far north. Statue of the Pricess Mother in the gardens near the entrance. In 1993, His Majesty the King made known his wish to rennovate the area around the Princess Mother's childhood home in Thonburi. Unfortunately, it was soon discovered that the building the Princess Mother knew as a child, which apparently was dilapidated in her time, no longer existed. However, there were some similar buildings nearby, which the owners gladly donated to the King for His project. Tree-enveloped gateway at the rear of the gardens. Most of the land is devoted to open space, with beautiful gardens incorporating crumbling elements of the old structures. Two exhibition halls were constructed, which now display photographs and mementos from the Princess Mother's life. The first hall displays well-signed photographs chronicling her life. The first large photograph shows the young princess at age 14, with long untamed hair and looking not a little wild. The photos and text carry you through her education in Bangkok, her meeting with the young Prince Mahidol, the birth of her three children, and finally her death in 1995 and elaborate cremation ceremony in 1996. The second hall displays pictures of her active life, her many projects, and even some very personal items such as Buddha images she sculpted for the royal family and a Mickey Mouse needlepoint apparently meant for the King. A reproduction of the house where the Princess Mother lived as a child. Behind the exhibition halls is a large park space. Off to one side is a reconstruction of the Princess Mother's childhood home in the neighborhood. There's also a small elevated gallery showing rotating exhibitions of photography by Thai artists. A gazebo shelters a statue of the Princess Mother and a small shop near the reconstructed house sells refreshments manufactured by some of her projects. You can get to the Princess Mother Memorial Park by boat. Take the Chaophraya River Express to the Memorial Bridge Pier. Walk across the old steel-girder Memorial Bridge to the other side of the river. The stairs up to the bridge are right across the street from the pier. When you get to the other side of the river, take the stairs down to river-front and follow the road around to your right. You'll pass under the other bridge and up the street a short way. A road will lead off to your left. Several green directional signs will point the way, but none of them are in English. Take this road all the way to its end and turn left. The Princess Mother Memorial Park is just a short way down this alley on your left. Confused? Then see our map to the park. Just follow the green line.